We had no official Monroney on the new 2017 Kia Cadenza. Our model, the Limited is purported to start at $45,290. We knew it had to be â€˜up there,â€™ given its â€˜richâ€™ feel. The color-Pluto Brownâ€”was exceptional and a real looker. The styling, different for 2017, is better than the previous Cadenza iteration. However, we think itâ€™s a tad stodgy. Hey, but nice car. A full-size sedan, the Kia Cadenza fits, weâ€™re not sure, in the lineup. With Optima, Azera (Hyundai), etc, it would almost seem superfluous. Quiet and almost Lexus-like, the 2017 Cadenza Limited is quiet, smooth and comfortable. Why, my passenger told me I looked very comfortable driving the Cadenza. Almost as if I wasnâ€™t even driving! Easy. No longer the go-to family car, the large sedans still can command a place in the market. Trust me, after you reach a certain age, two-door coupes no longer apply. Having a generous four-door sedan is Heaven. 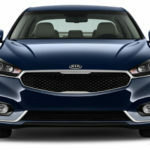 The 2017 Kia Cadenza is second-generation-only! Seems as though itâ€™s been around longer, doesnâ€™t it? Driving the Cadenza feels so much more, well, sophisticated. Why, with both heated and ventilated seats, what more could you ask for? 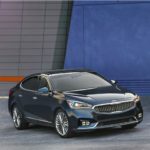 Kia has done a lot right in the new 2017 Cadenza; a market we even considered unneeded a few years back. So many choices? From one manufacturer. Perhaps appealing to all ages, the Cadenza provides a lot of cars in one: Highway cruiser, around-town shopper, easy to park and maneuver. The lines are taut and conventional; hardly daring, but will wear well with time. The interior is upscale, with very attractive leather seating, generous space and the upscale technology. 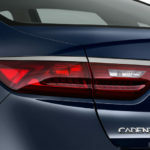 Lots of competition exists in this large sedan category; namely, Toyota Avalon, Ford Taurus, and perhaps, the Dodge Charger. Or the Fiat Chrysler 300. Chevrolet Impala, all new and redesigned could also be considered, along with Hyundaiâ€™s Azera and Nissan Maxima. Rear-wheel-drive is attractive to many consumers-this writer included-so there is still a market. And, one can probably get a great deal now on ANY sedan; as long as itâ€™s not a SUV. Kia sold about 28,000 Cadenzaâ€™s in its first generation; apparently, enough to continue its existence. The second generation, though, is much more luxurious, and in our mind, desirable. It would really be hard to make a choice today. Although the new Cadenza wonâ€™t â€˜defineâ€™ any segment, it is a nice sedan. It represents the best of the family sedan; reasonable, but no cheap, by any means. It surely offers a lot of space, high-end features, smooth ride and quiet that would be hard to match. We are assuming dependability, also. The 2017 Kia Cadenza is clearly a different vehicle; if only in looks alone. Complete with several eye-catching features such as multi-element headlights, a new concave grille with one of two inserts (depending on the model), Z-shaped LED lights and a totally different profile. It lies somewhere between the sporty Optima and the Kia 900. The dash is two-layered with gauges and infotainment screen split. We kept hitting the radio buttons when we wanted the climate controls, and vica versa. Bummer. Otherwise, itâ€™s fairly simple to master. The Cadenza is complete with Apple CarPlay and Android Auto, and a great Harman/Kardon audio system that we made sure to have one each time we entered the vehicle. We often had the benefit of the brake assist warning; apparently getting too close to the car in front of us! The cruise control and blind spot warnings also let us know they were around. Weâ€™re getting accustomed to the flash in the side mirrors, letting us know a car is approaching. Just taking a glimpse into the rear seat announces all the available room. Man, long-legged driers would be happy. There is ample headroom, legroom and because the floor is mostly flat-not much of a hump-the middle-seat passenger can relax in comfort. Equipped with Kiaâ€™s 3.3-liter V6 engine, this four-door sedan has 290 horse with 253 lb. ft. of torque; plenty of get-up-and-go for the road. Kia matches this V6 with a new 8-speed automatic transmission, making its debut in the 2017 Cadenza. Kiaâ€™s new shock absorbers us what is known at Kia as Amplitude Selective Damping. Apparently, they adjust to different conditions. Combined with an internal Hydraulic Rebound stopper, the structure is stiffer so that the the ride is smoother over harsh surfaces. We found the Cadenza to be the ultimate daily driver, taking all roads effortlessly. Kia doesn’t bill the Cadenza as a sport sedan, despite shift paddles on the steering wheel and selectable driving mode function that includes “Sport.” Drive it however you want, itâ€™s a great sedan on the highway, or through town. As with all new vehicles today, you can expect the highest in technology. The Technology model starts at $39,890, and the fully-loaded Cadenza (like our test vehicle) commands $45,290. Yikes. Apparently, this pricing is highly competitive. Weâ€™ll never see it, but itâ€™s great to be able to spend a week in the new Cadenza and enjoy its capability. We liked the 2017 Kia Cadenza, much more than expected. Probably out of our price range, though, itâ€™s not a contender, but would certainly consider it. EPA Fuel Economy: 20 /28 MPG. Warranty: 5 yr/60,00-miles basic, 5 yr./60,000-miles roadside assistance, 5 yrs/100,000-miles rust, 10 yr./100,000-miles powertrain, 10 yrs./100,000-miles drivetrain. Our 2017 Hyundai Tucson Night came in Caribbean Blue, a real looker, with black cladding and black wheels. We rather liked it. All-new and slightly larger for 2016, the Tucson was restyled (sheetmetal), and now gets better fuel economy, handles much sharper and offers more interior space. What may be most noticeable in the 2017 Hyundai Tucson is the ride. One almost feels as though she is floating over bumps, with little or no jarring and a much more pleasant ride. One thing that always stood out in the early Tucson models was how hard it rode. Not anymore. This compact crossover is one of Hyundaiâ€™s most popular vehicles, competing with lots of others including the Ford Escape, Toyota RAV4, Chevrolet Trax, and of course, Honda CR-V. The 2017 Hyundai Tucson comes standard with a direct-injection 2.0-liter four-cylinder, pumping out 164 horsepower, with 151 pound-feet of torque, and mated to a 6-speed automatic transmission. Three driving modes (Eco, Regular, Sport) are standard; we stayed mostly in Eco, but went back/forth with Sport mode. 1.6-liter (175 horsepower, 195 pound-feet torque), and Hyundaiâ€™s 7-speed dual-clutch transmission. Not terribly peppy, the turbocharged 1.6-liter performed well, with few hesitations, and smoothness. The 2.0-liter engine is rated at 23/31 mpg., and 26 mpg combined with FWD. The 1.6-liter turbo is rated 25/30/27 mpg when equipped with 19-inch wheels (like ours). When opting for the 17-inch tire, the 1.6-liter gets 26/33/29 mpg. Hyundai has built in more high-strength steel in this yearâ€™s redesign of the Tucson, thus safety ratings are expected to be better. As with all vehicles today, the Tucson has six airbags and standard rearview camera. Available in four model choices, the Tucson can be had in SE, ECO, Sport and Limited. The SE trim level is equipped with the 2.0-liter engine; the Limited model with the Ultimate package includes ventilated leather seats and a panoramic roof. The 2017 Tucson now has a sculpted style, bringing it more into the fray of upscale small SUVâ€™s. The design is the best yet, and with the 19-inch black wheels and black cladding, this is one sharp SUV. For the most part, Tucsonâ€™s cabin is quiet, certainly by comparison to older models. The dashboard and console are simple, yet handsome. Controls are well-placed, easy to handle, however, the screen in our test Tucson is very small-3.5-inch LCD information display. Our Night test Tucson didnâ€™t come with the Nav system. Bluetooth, AM/FM/CD/MP3 Audio system with iPod/USB/Aux input jacks, Sirius Radio are all included. We especially liked the Panoramic sunroof, which is assumed comes with the Night edition. The only option on our test Tucson was the carpeted floor mats ($125). Otherwise, for just over $30,000, one gets a lot of vehicle. All the safety equipment one expects is standard, including Electronic Stability Control, ABS with Electronic Brake Force Distribution and Brake Assist, Downhill Brake Control and Hillstart Assist Control, Tire Pressure Monitoring System, side airbags and rollover sensors. We got a few hundred miles of seat time in a Limited with the 1.6-liter turbocharged engine, and the power is adequate in most situations, but the response is sluggish under hard acceleration. Surprisingly, the three different driving modes don’t have much effect on performance. In any mode, the shifts by the 7-speed dual clutch transmission shifts are almost imperceptible. Gross weight: 4,784 lbs., curb weight: 3,686 lbs. EPA Fuel Economy: 25/30 mpg.